Here’s a list of 'most of' the songs I perform or have been known to perform! There may be others and I keep thinking of them and adding them to my list. It may be that I’ve simply forgotten to put your favourite song on here. Just ask me – or I might even learn it! Many of the songs may be familiar to you – apart from the Folk ones. 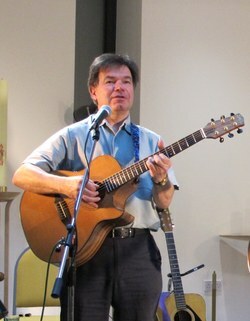 Folk, or acoustic roots music, is my passion and I have been involved with the Folk scene all through my musical life. There are so many fantastic writers and musicians who few people may have heard of, and I like to perform their songs and spread the word. For convenience I have categorised the songs by genre.